"Socialist" is the dirtiest insult in American politics. So when I arrived at a hotel lobby last Thursday night to see what a conference that had the audacity to call itself "Socialism 2012" looked and sounded like, I wasn't sure what to expect. Was anyone actively involved in political and social struggles relevant to the average person going to be there? Or was this just going to be parade of faux-revolutionaries wearing t-shirts with pictures and quotes from radical icons, patting themselves on the back for their own self-righteousness? And more importantly, would anything happening over the next four days actually have an impact in the Chicagoland area (much less the world)? Sure enough, I immediately found groups of 20-somethings in the hallways hawking t-shirts with sales pitches like "Get your Egyptian revolutionary socialist t-shirts here! Straight from Tahrir Square! $20!" But as the weekend progressed, I found much more than I ever could have expected. 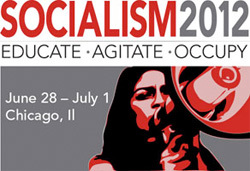 Nestled between several interstate highways and the nearby O'Hare Airport, the Socialism 2012 conference took place at Crowne Plaza Hotel & Conference Center in Rosemont over the course of the evening of Thursday, June 28 through the afternoon of Sunday, July 1. Co-sponsored by the Chicago-based Center for Economic Research and Social Change (publisher of International Socialist Review and Haymarket Books) and the International Socialist Organization (publisher of Socialist Worker), the annual Socialism conference has been a gathering of academics, speakers, and activists, with a wide array of panels hosted by people like Glenn Greenwald, David Zirin and Sherry Wolf. According to their website, "The International Socialist Organization (ISO) is committed to building an organization that participates in the struggles for justice and liberation today--and, ultimately, for a future socialist society." As Socialism 2012 co-organizer Keeanga Taylor pointed out to me, the conference began as an educational event, and now also serves as a networking opportunity for activists. This year's edition of the conference had over 120 talks and panel discussions, ranging from introductions to Marxist theory and the history of Marx-inspired movements in America and abroad to analysis and critiques of minority oppression, sexuality, culture, sports, education, labor, student movements, and more through the lens of Marxist thought. Upon first glance, the itinerary seemed like a mish-mash of traditional Left causes with vague connections to each other. With so many options and as many as 11 talks happening in any given timeslot, I was only able to attend nine of these panels. To help pick, I decided to go to talks related to issues that seemed related to what people and political movements in the Chicagoland area are facing today. But even with just those talks and subsequent audience discussions, I started to see the connections between everything issue being addressed that weekend. As one member of the ISO put it to me, the overarching theme of Socialism 2012 was "how Capitalism causes a diversity of oppressions." And I saw how the exploitive, racist redlining of black families in the Chicago housing market led to a social circumstances making multibillion-dollar sports industry a popular way of escaping economic circumstances for thousands of black men. How billionaires simultaneously funded campaigns against organized labor and NGO's focused on solving the world's problems through the salvation of individuals, rather than social and economic classes. How workers and activists all across the country were frustrated with union leadership and the Democratic Party for getting in the way of their own well-being for the sake of electoral victory. How systematic oppression and fear of authorities ranged from police monitoring and entrapment of Muslim American communities and NATO protesters to outright police brutality and murder of unarmed men. Throughout all these discussions, I saw how politically, economically, and socially-disadvantaged, disunited people were systematically exploited and oppressed. And on the flip side, I saw how lessons and ideas from the past were relevant today, from Marx's observations on the working class, to Martin Luther King Jr.'s advocacy of civil rights alongside worker rights, and countless situations where people uniting in solidarity against any given form of oppression were able to challenge the powers that be and change their lives for the better. But subject matter wasn't the only diverse aspect of the conference. Throughout the weekend, there were nearly a thousand people of different ages, races, and nationalities sharing stories and debating ideas on how to approach social problems both local and global in scope. A wide variety, including people with hijabs and jean shorts, dreadlocks and bald spots, Birkenstocks and Converse All-Stars. People with name tags listing locations from Portland to Paraguay, Corpus Christi to Rochester. College-aged Occupy activists and union activists twice (and thrice) their age. Self-identified Marxists, socialists, anarchists, leftists along with people learning what those words meant for the very first time. And beyond the diversity of looks were the stories of why people came. An Atlanta-area journalism major who was arrested in Zuccotti Park. A laid-off teacher from New York whose 54-year-old husband became a socialist after attending the conference in 2009. Retired postal workers rallying to fight looming service cuts and layoffs at the United Sates Post Office. Long-time members of the ISO. First-time attendees who heard about the event through a friend, a family member, or a group they were involved in back home. Members of the defeated Greek Syriza (Radical Left) Party looking to spread the lessons they learned in their fight against European banks. Black and Latino parents of children killed through police brutality looking to get answers. People who attended all four days of the conference. People who just came to see one or two speakers. Even within Chicagoland area, the cross-pollination of people and ideas struck a particularly resonant chord. Wisconsin public-sector union workers fed up with Scott Walker praised the numerous Chicago Teachers Union members at the conference for their overwhelming vote to authorize a strike, and offered advice and future support for their efforts. Regional union workers, ISO members, Occupy activists, and other interested parties discussed future meet-ups and events across the Midwest and causes they could pool their collective efforts into. Local newcomers to the conference learned about the ISO Chicago branches that meet weekly in Pilsen, Rogers Park, Logan Square and the campus of the University of Illinois Chicago and readily signed up to join. The interactions I saw between the Chicagoland attendees seemed to be a perfect microcosm what was happening to everyone throughout the entire conference: the realization that they were not alone, that there were hundreds of people who believed what they did, and through hard work and unity, they could confidently go forward to be the change they wanted to see in the world. Conservative New York Times columnist Ross Douthat recently wrote that it would be difficult to imagine an American equivalent to Greece's Syriza party. And while I didn't hear any calls to form a new political party, I did hear people continually use the words "comrade" and "solidarity" and with no trace of irony or cynicism. As the conference went on, there was a palpable sense of a reunited, reinvigorated American Leftist movement coming together at that very conference. And more importantly, a movement not only inspired by the lessons and legacy of the movements that came before, but also one willing to build itself from the bottom-up and fight for social justice against economic and political exploitation and oppression wherever it may be found. After four days of Socialism 2012, I'm not convinced that the Marxist framework of working classes struggling against the rich is the main cause of all major world problems above all others. I'm not convinced that a revolutionary socialist society can built on top of a racially, socially, politically, and religiously-divided country of 312 million people, and that the solidarity of people of similar income levels can permanently erase the causes and perpetuation of xenophobia and tribalism that run through the course of human history. And I'm not convinced that the top 1percent of the human population can and should be treated as a collective unified force against a collective 99 percent in every situation and context. After all, Zionism and Hamas both have billionaire supporters (to cite just one example). But with the growing income gaps, unemployment, and economic malaise across the US and the rest of the world, I'm convinced that the American people will be looking for answers on who to blame and how solve their problems. I'm convinced that the vast majority of the Socialism 2012 attendees, armed with new ideas, new allies, and new understandings of the history of social change will be more than willing to spread the gospel of social change through socialism. I'm convinced they will reach out to struggling groups and individuals, lend a helping hand, build solidarity, and slowly spread the idea that another kind of society may be possible. And despite the absolute disgust the word brings out in millions of American voters, I'm convinced that there will be a gradual rise of Americans unapologetically identifying themselves as socialists, ready to counter derisive talking points and skepticism with their own beliefs and their own willingness to take on the problems they believe stem directly from the actions of the top 1 percent. So what does socialism mean to Chicago in 2012? It means the resurgence of a radical Left built on newly-networked Occupy Chicago activists, members of ISO's several Chicago branches, long-time supporters and members of unions (particularly the Chicago Teachers Union), jaded Obama supporters, and community activists, dedicated to building alliances with underprivileged communities and people seeking social change from the South Side to the suburbs. It means the rise of a radical American Left increasingly indifferent to the electoral prospects of Barack Obama and the Democratic Party as a whole. And it means that Obama's former chief-of-staff and current Mayor of Chicago, Rahm Emanuel, will face a new, inspired wave of community organizers and activists ready to take on a citywide agenda of union-free charter schools and giving away city funds and TIF money to corporations and developers. It's too early to tell, but with the rise of overall dissatisfaction at home and abroad, Chicago just may become the forefront for the re-emergence of an active, networked, class-conscious movement across the United States that is just as much indebted to the ideas of Karl Marx as the Founding Fathers. And maybe someday, Americans will come to understand that a "Chicago socialist" is something quite a bit different than Barack Obama. Hi and thanks for the great article. I just wanted to point out that it's the ruling class exploiting and oppressing the working class that causes the emiseration of the working class, not the struggle against it, as your sentence construction implies. And the reason there are wealthy (bourgeois, or capitalist) backers of both Zionism and Hamas is because every society/nation has a ruling class and right now it's the bourgeoisie. So there are multiple ruling classes competing for power, and the reason we treat them as "the same" (even though some are usually class traitors, like Engels) is because the diverse ruling classes tend to unite to overcome a threat from below. Thanks so much for coming to the conference and writing about it! Appropriate that this movement would be spread out from Chicago, the center of thugery and crooked dealings. What is pitiful is that they think this is a movement originating in the working class when in fact it comes from a group of elitists like George Soros who uses the working class to create chaos. That is exactly how Socialism and Communism have taken over every country they rule. Despots and Tyrants come in stir up envy and resentment in the working class against those who have excelled financially. The first thing you know well to do people will be stripped of their assets and killed in their homes and those who do it will feel completely justified doing so. I am not one of the wealthy. I make less than 40,000 a year, and I could sure use some health insurance. But not at the price of mine or others freedom. Sweet. Gapersblock now has a rightwing conspiracy theorist that is more driven by internet and talk radio paranoia than rational thought and facts. We haven't seen comrade Soros at a meeting yet.